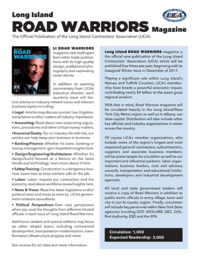 The Long Island Contractors’ Association is pleased to introduce our new magazine entitled Long Island ROAD WARRIORS. ROAD WARRIORS is a high quality, quarterly trade publication featuring professional imagery and captivating cover stories about the people, politicians and businesses that influence our organization and impact the heavy construction and infrastructure industry. Every edition contains articles on industry-related business matters including: Accounting, Design/Engineering/Architecture, Insurance/Surety, Banking/Finance, Law, and Safety/Training, among others. LICA Executive Director Marc Herbst will offer opening commentary and LICA’s government relations consultants will provide “News & Views” about relevant political matters on the local, state or federal level. To gain a unique perspective on politics and politicians, we’ll also feature an article penned by a different elected official in each issue. Additional articles and special editions may focus on topics such as commercial development, transportation modernization, labor issues, key infrastructure projects and more. We believe readers will find this magazine both informative and interesting, and we hope you will be part of its success. ROAD WARRIORS offers a unique and powerful advertising opportunity for both members and non-members alike. Use Road Warriors to promote your business to the Island’s premier general contractors, subcontractors and suppliers, as well as to influential industry partners, all while supporting the LICA organization. 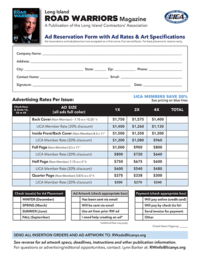 Plus, LICA Members receive a 20% discount off all advertising rates. Learn more. Click the PDFs (at right) to view the Sell Sheet/Overview with circulation info and advertising rates or download the Ad Reservation Form to reserve ad space and see details on rates, deadlines and art specifications. For inquiries about editorial or other content-providing opportunities, email: lbarker@licanys.org.